Chemistry 2 VCE Units 3 and 4 eGuidePLUS (Online Purchase) provides teachers with online support through instant access to student and teacher texts plus a complementary set of extensive, customisable assessment (including SACs) and curriculum materials to make teacher planning and preparation easier. • Full answers and worked solutions for all questions. • Practical Investigations with answers and advice. • Complete, in-depth coverage of the new VCE study design for 2017-2021. • New HTML5 interactivities are available. These are designed to engage, excite and enhance understanding by bringing difficult concepts to life. • The theory is written by highly experienced and successful teachers with a proven and fundamental understanding of how students learn and succeed in exams. 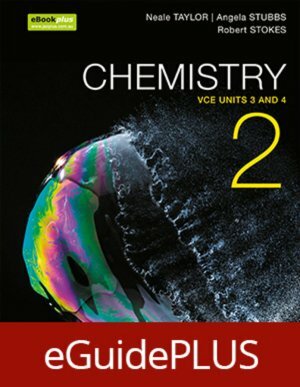 • studyON VCE Chemistry Units 3 and 4 is fully integrated with the student text. studyON is Jacaranda’s unique study, revision and exam preparation tool. • Work programs, topic tests and SACs equip teachers with extensive support materials. Teachers can rely on Jacaranda’s dedicated customer service and support.